The All-New PV® 10 AT Mixers Come Equipped With Antares® Auto-Tune® Pitch Correction, A Technology That Can Literally Help Anyone Sing In Key And Is Used On Professional Recordings And Live Performances Throughout The World. This Technology Is Incorporated Directly Into A Complete And Powerful Portable Mixing Solution, Ensuring That Your Audience Will Experience Perfectly Tuned Vocals To Complement The Crystal-clear Audio Of The Mixer. Features Such As Bluetooth® Allow Seamless Connection To Almost Any "Smart" Device. Multiple Direct Outs Per Channel Allow Easy Connection To Most Daw Interfaces For Recording. In Addition, These Mixers Can Stream Audio Directly To A PC. MP3 Playback Is Also Available Via USB A Port And LCD Display. 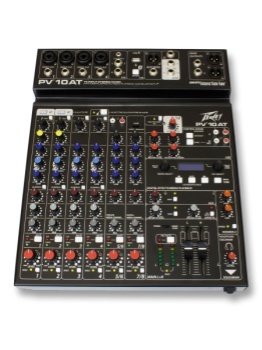 With A Slim, Low-Profile Design, Pv At Series Mixers Are Ideal In Small To Mid-size Venues. Key Features Include 2 Channels Of Antares Auto-tune, 4 Channels Of Reference-Quality Mic Preamps, 4 Direct Outputs For Recording, Bluetooth® Wireless Input, And Built-in Digital Effects With LCD Display. This All-New Mixer Will Provide Years Of Hassle-Free Operation.